In my last blog, I discussed how evidence-based policymaking is integral to engendering more sustainable places and communities. Moreover, I argued that citizens (and citizen science-based models) offer a fruitful avenue for research that contributes greater evidence to policymaking. I cited the example of the Evidence Information Service, a project to help facilitate increased use of scientific evidence (and by this I mean evidence from across the disciplinary spectrum including STEM, social science and humanities subjects) to inform UK policymakers and parliamentarians. The EIS was originally inspired by academics from Cardiff and Exeter and has now been extended as a GW4 initiator project. In this extended blog I am casting my geographical gaze even wider than the UK and assessing what the politicians and national delegations have agreed on at the recent 21st Conference of the Parties (COPs) meeting in Paris and whether the Paris Agreement is transformative for international climate policymaking in comparison to previous COPs that have often promised more than they have actually delivered. Well the political dust is starting to settle now in Paris after the Paris Agreement was finally etched onto paper in the early evening of Saturday 12th December. 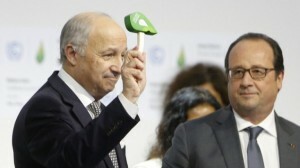 On the face of it, the politicians were very happy with their accomplishment with Laurent Fabius, the French Minister of Foreign Affairs and International Development and President-designate of COP 21, waiving the official green gavel of the conference and then proclaiming “with a small hammer you can achieve great things”. Well let us cut away from all of that political pretence and think about whether the Paris Agreement is actually a landmark deal to tackle anthropogenic greenhouse gas emissions. Is the Paris Agreement transformative in any way, shape or form than previous agreements? Alternatively, is it just another example of international policy greenwash to enable larger developed nations to keep emitting more greenhouse gases at the expense of other poorer countries? In the build up to the climate negotiations I was talking to my masters students about expectations for the Paris COP. I asked them whether (after a 2 hour lecture on international climate governance), given previous evidence of how COPs had faired would Paris be any different in forging a more consensual and geographically equitable climate agreement that had legally binding policy teeth? In the lecture, we discussed, inter alia, the history of international climate negotiations, alliances between countries at the international level (like the Group of 77 or AOSIS) and of particular importance the role of Intended Nationally Determined Contributions (INDCs) to give a formative policy context to the build-up of the Paris negotiations. For those not aux fait with international climate policy, every member party of the UNFCCC was ‘asked’ at COP 19 in Warsaw in November 2013 to submit an INDC to help shape the 2015 Paris negotiations. Essentially, INDCs would quantifiably outline each member parties post-2020 climate actions, particularly around climate mitigation strategies (how each country would reduce their greenhouse gas emissions over the next few decades with specific national emission target figures), but also on what adaptation strategies member parties also intended taking to ensure increased future climate resilience. At the time of writing 160 INDC submissions had been received (this equates to 184 countries in total because some submissions were collective e.g. EU). Once my students were ‘armed’ with all this knowledge, well their responses were pretty pessimistic pre-Paris, with the majority feeling that the Paris negotiations were in for a stormy ride with respect to establishing a legally binding agreement. I was also in agreement with them. But one thing I was happy about was their nuanced understanding of the complexities and histrionics of international climate negotiations as a means to inform an opinion on whether Paris would be transformative in the sense that it represented a paradigm shift in international climate policy, particularly around the idea of collective national alliances, and how certain countries collectively coalesce around particular ambitions and carbon pledges. Now you are not going to hear that we were proven wrong with respect to what culminated in Paris, although I would love to say that we were. Many of the politicians are obviously heralding the negotiations a success and the majority of press reporting I have seen post-Paris are also generally upbeat about the policy strides made. The word ‘transformative’ has been bandied around a lot by significant notaries including UN Chief Ban Ki Moon and Cardinal Pietro Parolin, Vatican secretary of state. The word has also seeped into the media reporting of the Paris Agreement – too many news reports to hyperlink here. When we cut away all the flesh to reveal the bones is the agreement actually transformative? As an environmental political geographer I am very interested in how the term ‘transformation’ is used and applied. As the Paris COP demonstrates, transformation is slowly becoming more common in political lexicon, particularly in the context of global environmental change. However, it is already a well-established term, not only in my academic sub-discipline, but other cognate disciplines too as a means to understand the socio-political context of global environmental change (see Feola, 2015 for a review). The IPCC has also formally adopted the term in the most recent Fifth Assessment Report with the chapter title ‘Assessing Transformation Pathways’. Yet the terms ‘transformation’ or ‘transformative’ as Feola argues remains a highly conceptual and even ambiguous word (just like sustainable development and resilience). As a political geographer studying the socio-political scalar ontologies of climate change, transformation to me is about a change of a system completely; not just a change in some of a given system’s characteristics. This change allows a new system to usurp a preceding system, allowing new knowledge to come to the fore that enables the production of new norms and values within the new system. Basic concepts are also changed in this process, hence representing what Thomas Kuhn described as a paradigm shift way back in 1962 when ‘The Structure of Scientific Revolutions’ was published (you see transformation is not a new term and was unconsciously described by social theorists 50 years ago!). Yet the political geographer in me is rather disappointed with the Paris outcome, but maybe I should not have expected more from the negotiations. If we think that Paris represents a transformation of climate policy of any sort we are sadly mistaken. Transformations and paradigm shifts, as Kuhn argued, are cumulative and are a result of policy failure and cannot be explained ‘within’ the current paradigm. The politicians at successive COPs are yet to realise the architecture of the entire international climate regime under the UNFCCC, Kyoto Protocol and indirectly the technological and scientific reductionism of the IPCC (our current climate policy paradigm) is fundamentally flawed. I am not the first academic to argue this – more esteemed colleagues like Steve Rayner, Gwin Prins, Diana Liverman and Roger Pielke Jnr and many others have argued this case for nearly two decades. The current system has not be changed paradigmatically. In fact, the international political system has reaffirmed further policy retrenchment into market-based solutions as a means to offset carbon. To assess whether the Paris Agreement represent a paradigm change or transformation in international climate policy, I just want to briefly elaborate on three elements of the Paris Agreement (there are more): i) the ‘no more than 2˚C’ rise scenario; ii) the reassertion of market based mechanisms to reach the <2˚C goal and; iii) the idea that the agreement is geopolitically more equitable. Paragraph 2 of the main text of the agreement states that “estimated aggregate greenhouse gas emission levels in 2025 and 2030 resulting from the intended nationally determined contributions do not fall within least-cost 2˚C scenarios”. But what does this mean in terms of policy transformation or a paradigm shift? Well not much really. The less than 2˚C scenarios is only a goal and there are no fully legally binding mechanisms attached to countries to reach this goal. It is a positive step in the sense that there is greater consensus over a collective ambition to limit global temperature, but this is not an example of paradigm change or transformation because the non-binding system in which the agreement operates has not changed. Countries are still working towards this target within the existing political system. A step towards the cusp of transformation may be having the necessary legal mechanisms in place keep countries on track, not just temporally ratchet up targets every 5 years as Article 4 in the annex states. The enervated notion of targets and goals unsupported by a legally-binding framework is illustrated in the last sentence of the main text (Paragraph 140) which reads, “Urges Parties to make voluntary contributions for the timely implementation of this decision.” When you see language like ‘urges’ and ‘voluntary contributions’ you just know that there is gaping leeway in the agreement for countries to renege on targets and pledges. The liberal use of the term ‘transparency’ throughout the agreement also suggests the non-punitive nature of the agreement. Countries are not legally accountable in any way if they don’t meet their Nationally Determined Contributions – they can only be named and shamed. I guess China, India, Russia are quaking in their boots. Legal weaknesses and ambiguous language in the agreement does not make for a transformative change in international climate policy. The final agreement had no mention of carbon trading, emissions trading schemes and the like. But they were certainly there looming large in the background. The Paris Agreement is littered with the term ‘market approaches’. Article 6 of the annex is where you find the marketization lexicon. It refers specifically to the “use of internationally transferred mitigation outcomes” (6.3) as a means to “incentivize and facilitate participation in mitigation of greenhouse gas emissions by public and private entities authorized by a party” (6.4b). Well this is just an invitation for the private sector to make money off the back of carbon. There is also the issue of whether market approaches can actually offset enough carbon to actually reach the 2˚C goal, let alone below that. To reach a fossil fuel free future by 2050 will take more than just market approaches – you just have to look at the rollercoaster experience of the EU Emissions Trading Scheme. Yes I know China are now ramping up their emission scheme for 2017 which will have some mooted carbon saving benefits no doubt, but the idea that carbon markets will help attain the 2˚C target is preposterous and politically naïve. We need more schemes that will produce negative net emissions like carbon capture and storage. Research investment and government subsidies need to be ramped up for schemes like this if we are to have a chance of limiting to 2˚C. The ‘all eggs in one basket’ solution of market approaches do not incentivize global emission reductions that are politically-led, it only incentivizes private sector capital accumulation interests. To have a chance of reaching the 2˚C target, investment in carbon capture and storage needs ramping up. Therefore, market approaches alone do not make for a transformative change in international climate policy, they rather perpetuate the current dominant global economic system of capitalism. 3. A more (geo)politically equitable agreement? The agreement has recognised that all 196 member countries have equal responsibility in reducing emissions (throughout Article 4), unlike the Kyoto Protocol which placed a greater burden on certain Annex 1 developed countries to reduce emissions. On the face of it this seems positive and more equitable, but it does in a sense weaken the idea of common but differentiated responsibility in favour of more developed countries because it draws attention away from all the developed countries’ emitted greenhouse gases since industrialisation. Furthermore, the agreement still uses language that potentially perpetuates geopolitical differentiation. Article 4.4 states that developed countries still need to take the lead by undertaking economy-wide absolute emission reduction targets. The fact that there is the principle of common but differentiated responsibility remaining in the agreement can conversely to my first point construe that developed nations have certain responsibilities over and above less developed countries. Yet this also has an opposite effect of elevating and perpetuating geographies of geopolitical distrust within the international climate regime through geopolitical binaries like the North vs South, geopolitical alliances based on shared economic interest (G77, AOSIS, Umbrella Group, BASIC etc) and national sovereignty issues. Ambiguities surrounding the specific nature of how geographical and territorial interests in the agreement can be placated does not make for a transformative change in international climate policy. In conclusion, the Paris Agreement can be seen only as a triumph in the way international geopolitics are enacted in the sense that every country was more collective and ambitious in their thinking. However, whilst the current architecture of the international climate regime (UNFCCC, Kyoto, and indirectly, the IPCC) represents our only international geopolitical route to tackling climate change, the silver bullet will be in how action is taken at national levels – and not just by government, industry (now with the increased emphasis on market approaches) have a central role in reaching net zero and even negative carbon emissions. In this sense, the success of Paris was more about geopolitics than action on climate change. Only when national politicians (especially in developed economies) understand this can they start to think more transformatively about how to change the relevant systems to tackle protracted issues like anthropogenic climate change. The recent vote in UK Parliament on the 15th December (after the Paris Agreement was reached) to approve licenses for fracking in national park areas of the UK shows the political naivety and absurdity of our economic and political systems; and that transformation merely remains a buzz word in the corridors of climate policy.